Duns driver Garry Pearson believes he and Welsh co-driver Dale Bowen are “underdogs” in the battle to become the 2019 KNC Groundworks Scottish Rally Champions, despite their recent form. Pearson is currently second in the standings after scoring the same result on the season-opening Border Counties Rally, with a spin costing him valuable time against eventual winner Euan Thorburn. Heading into the Speyside Stages, Pearson is in high spirits after a strong start to his season on round one. “I’m looking forward to getting into the DVD and having a look at the stages,” Pearson said. “We had a good feeling in the car on the Border Counties and need to start where we left off. “There’s definitely no frustration [about finishing second], I had to put my hands up on the day that I made the mistake. Those points are in the bag now and our focus is now fully on the Speyside. 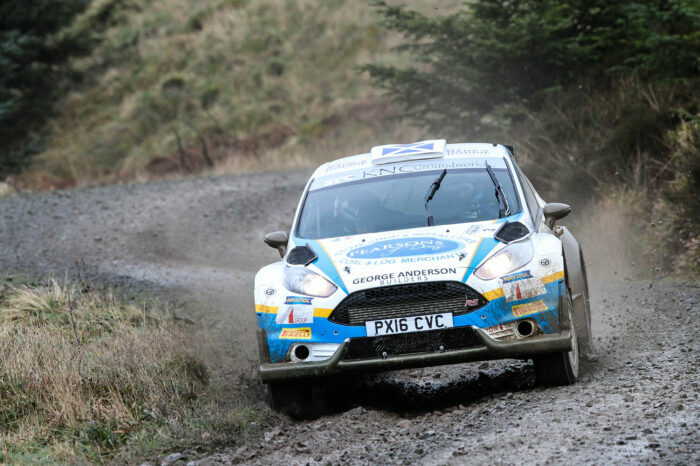 Pearson has a love-hate relationship with the Speyside Stages. He is one of just three previous Speyside winners heading to Elgin this week, after grabbing his maiden SRC victory back in 2016, but crashed out of last year’s event heavily. The Duns driver is blocking any of those thoughts from his mind however, and is focused solely on doing all he can to become the 2019 Scottish Rally Champion. “I enjoy the event,” he said. “Clearly I’ve had ups and downs on the rally but the confidence is very high in the camp, our sponsors and team are confident in our abilities so we can’t wait to get going. “Euan [Thorburn] has a lot of experience in a four-wheel-drive car and is no doubt a rival and a competitive one at that. “Our main focus however is to win the title, so if that means beating Euan, Jock [Armstrong] or any other competitor we’ll be doing our best to do that. “We’re still underdogs. Trading times with them after just 11 events in an R5 car has been awesome fun so far.